M T D D e c e m b e r 2 0 1 8 40 2 0 1 8 S E M A S h o w T he struggle to find and retain good employees doesn't take a break when tire dealers gather in Las Vegas to attend the Specialty Equipment Market Association (SEMA) Show. Fortunately, educational sessions and forums at this year's show offered tips, tools and best practices to help dealers with the process. During a panel discussion of tire dealers, Mark Smith, owner of Midas of Richmond, a four-store operation in Virginia, revealed how much he values a good technician. "e most effective tool we have is our people," Smith said. "When the time comes and we want to grow, I'll walk out in the bays and talk to the techs." He asks if they have someone to rec- ommend. If he makes that request in the morning, Smith said he's certain he'll have three names by the aernoon. "We spiff it. We have great luck," he said. It's a generous spiff for the technician who made the recommendation — worth $6,000 if the new person is hired and works at least six months. Here's how it breaks down: $500 the day the technician is hired; $500 at the end of the first week; $1,000 at the end of 30 days; $2,000 aer 90 days; and another $2,000 aer 180 days. "Hard, cold cash." 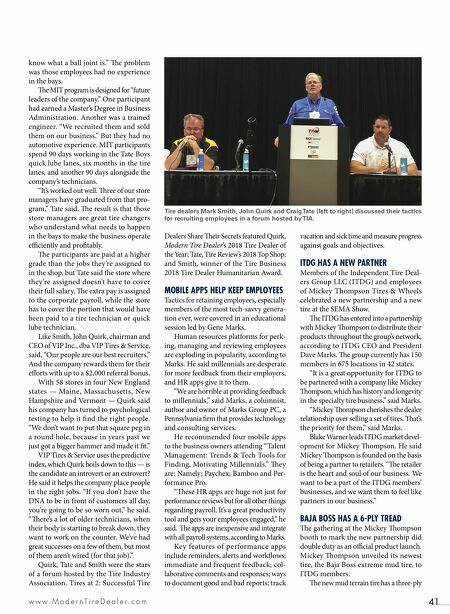 Craig Tate, owner of Tate Boys Tire & Service LLC, said his family-owned dealership recruits employees "nonstop," using online hiring platforms like Indeed, as well as visits to college campuses. e company, with six locations in northeast Oklahoma, also has created a Manager in Training (MIT) program to guide prospec- tive store leaders. Tate said the company did a good job of finding employees for the front counter. 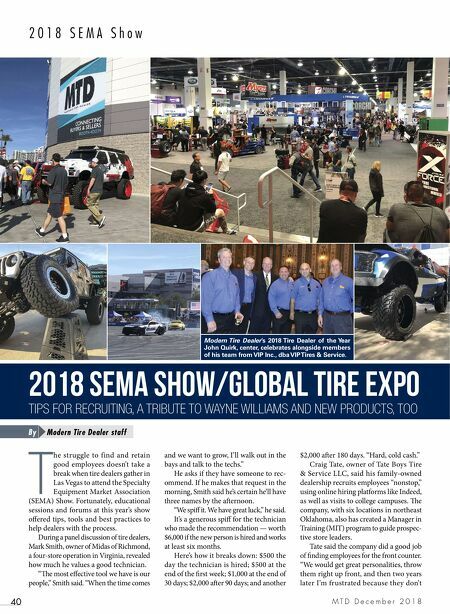 "We would get great personalities, throw them right up front, and then two years later I'm frustrated because they don't 2018 SEMA Show/Global Tire Expo TIPS FOR RECRUITING, A TRIBUTE TO WAYNE WILLIAMS AND NEW PRODUCTS, TOO Modern Tire Dealer staff By Modern Tire Dealer's 2018 Tire Dealer of the Year John Quirk, center, celebrates alongside members of his team from VIP Inc., dba VIP Tires & Service.